We’ve seen the teaser poster for Age of X-Men, coming to Uncanny X-Men after the first weekly X-Men Disassembled arc. 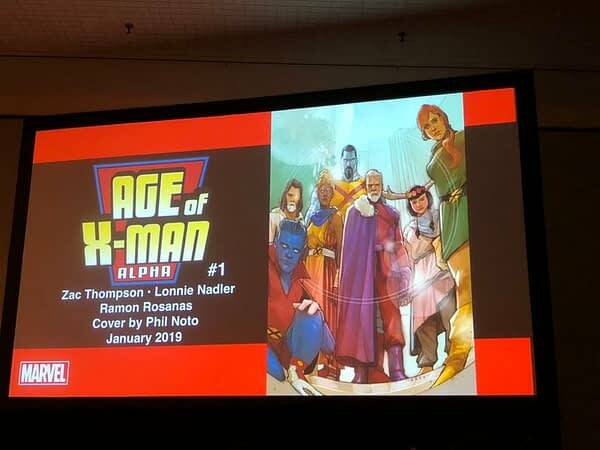 We’ve learned of the Age of X-Man Alpha one-shot by Zac Thompson, Lonnie Nadler, and Ramon Rosanas coming in January to kick it all off. And all the while, we’ve assumed this is about Nate Grey, even if holding out a little hope that it could somehow be twisted into the return of Cyclops, who was, as Bleeding Cool Rumourmonger-in-Chief Rich Johnston pointed out, the first X-Man, after all. So there you have it. Age of X-Men is Nate Grey coming back “in a big way.” But they didn’t specifically say Cyclops would not return, so… we’re still holding out hope. Speaking of the verified most popular X-Man ever, panel attendees asking questions during the panel were encouraged to name their favorite X-Men villain, so of course one named Scott Summers himself, eliciting the reaction you’d expect, X-fans. “Good luck walking out of here,” warned Marvel’s Jordan White. Bleeding Cool’s Madeline Ricchiuto was at the panel sending us live updates.